The Zeta Mat incorporates a unique stud pattern that secures the mat to the floor surface for maximum grip, Moving your office chair is effortless whilst protecting the original floor surface. Heavy duty plasticised clear solid vinyl that won\'t crack or break. 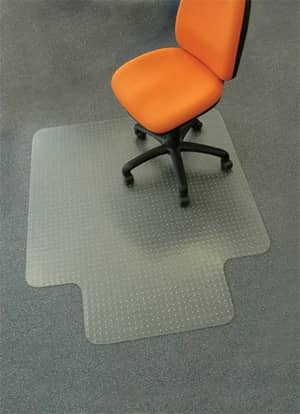 Incorporating a unique stud pattern that secures the mat to the floor surface for maximum grip, moving your office chair is effortless whilst protecting the original floor surface. The mats also feature a cut away foot section to allow for easy placement under nearly all desk styles.